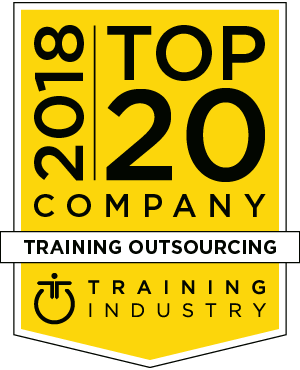 As part of our commitment to the industry and as a service to our community, Training Industry is pleased to announce our 2018 Top 20 Training Outsourcing Companies list. Training Industry continuously reviews companies that provide training business process outsourcing (BPO) services and conducts an annual assessment to determine suppliers’ experience and capabilities. Because of the diversity of services included in training outsourcing engagements, no attempt is made to rank the Top 20. Lionbridge is the only company that can design, develop and localize training solutions under one roof globally. Our work with technology leaders such as Google, Apple and Microsoft expose us to trends such as machine learning, AI, big data, wearable devices and AR/VR – all of which will have an impact on training in the future. At Conduent we focus on each client’s broad learning constituency — employees, customers, vendors, business leaders and/or channel partners — to design and successfully deliver fully outsourced learning services, as well as partial or discrete solutions. While we have the global reach and scale to meet the largest of client need, we are proud to retain the culture and characteristics that are normally associated with a boutique firm. All of our employees know each other, and our clients are sure to get coordinated assistance and advice from any part of the business, at any time, in any geography. Cognizant is a global leader in business and technology services, helping our clients bring the future of work to life. The team has been providing end-to-end learning and content solutions for over a decade to a broad range of customers. CGS Enterprise Learning supports over a million global learners each year and retains 95 percent of our customers. Many of the world’s most admired companies rely upon CGS to onboard employees faster, improve retention rates, deliver global training, upskill employees with personalized custom content and learning outsourcing solutions. QA helps individuals and organizations achieve their potential through world-class learning strategy and solutions. This includes training and certification, innovative talent solutions that solve both business critical skills and capability gaps, business transformation solutions, enabling change and transformation and managed learning services. GP Strategies has demonstrated how to ensure the value of learning as part of business initiatives. By applying solid analytics to the processes related to learning, our learning solutions have become indispensable to the business. Our services, solutions and technologies empower companies to perform above their potential. PDG helps our clients meet their business goals through strategic learning partnerships focused on driving the parts of the business where need is the greatest, or change will have the most meaningful impact. PDG provides a scalable implementation capability to drive bottom line results through improved workforce performance. Established in 1981, NIIT offers managed training services to market-leading companies in 40 countries. Our comprehensive suite of managed training services includes custom curriculum design and content development, learning administration, learning delivery, strategic sourcing, learning technology and advisory services. Aptara is a U.S.-based company harnessing the rapid emergence of digital media to provide its customers a competitive learning advantage. Aptara provides transformational learning and performance solutions to the world’s largest corporations. Aptara is a market leader in custom learning and performance solutions that deliver custom learning content. Using a combination of learning design and technology, LearningMate partners with organizations across a variety of industries to deliver data-enabled, digital learning solutions that create memorable and measurable learning experiences demonstrating impact on the key business factors and driving overall business performance. An award-winning innovator, The Training Associates is a recognized global leader in learning and development (L&D) talent and solutions. Our ability to support a broad range of L&D initiatives, an adaptive workforce of 25,000 L&D professionals and our expertise providing scalable training solutions make us the ideal resource for organizations of all sizes. Cegos Group (including Cimes & Integrata) helps companies boost the transformation of their learning and development (L&D) offering, process and organization. Now more than ever business’ and people’s agility are requiring better L&D agility: shorter time to competency, global reach, smart learning portfolio and interconnected platforms delivering personalized learning experience. We manage learning. NetCom Learning helps build innovative learning organizations by structuring a smarter workforce, supporting changes and driving growth. We've helped 12,000+ organizations achieve their goals by offering a full complement of managed learning services, including IT training, content development and consulting services. A subsidiary of Raytheon Company, a Fortune 500 company, Raytheon Professional Services, LLC (RPS), is a global provider of training services and performance consulting solutions. TIS (MPS Interactive Systems) is a global provider of interactive learning solutions with over 27 years of learning experience. TIS has built an enviable track record of designing solutions for a wide array of global clients, ranging from leading educational institutions to Fortune 500 corporations. MicroTek is truly one-of-a-kind in the industry. No other company provides the breadth of learning centers combined with the services and support around training events and meetings. MicroTek bases its service innovation on customer demand and need. We always rise to the occasion, striving to achieve 100 percent customer satisfaction with every event we deliver. Success to us is when we’ve successfully taken the complexity and hassle out of event planning and delivery so that clients can return to the work that is core to their business. Clarity Consultants is the leading provider of learning and development consultants. Clarity’s global network of 35,000+ consultants offers deep knowledge, low management overhead and flexibility to scale according to an organization’s needs. Clarity works with clients on a project basis, supplementing the talents of their internal staff until goals are achieved. For over 25 years, Infopro Learning has been unlocking the human capital for organizations with custom learning and training solutions. They provide a full suite of services in the learning and training field: content development, leadership and learning management, just to name a few. Eagle’s Flight is an innovative leader in the development and delivery of practical training programs for the global business community. Within all business segments, our focus is on results, driven by an experiential approach and supported by a variety of data-based assessments and evaluations. As part of our commitment to continuously monitor the training marketplace for the best providers and services, we announce the Training Outsourcing Companies Watch Lists. The 2018 Watch List recognizes thirteen companies from across the globe that provide outsourced learning services. Each company who participates undergoes extensive research, including thorough analysis of their capabilities, experience, and expertise. The end result is a list that acknowledges companies poised to capture share in the training outsourcing marketplace. The Learning Factor are experts in developing and delivering phenomenal learning experiences that engage, upskill, inspire and influence the people who matter to you most. For 25 years Ardent has helped our clients thrive in business by developing custom training solutions. We believe the most effective learning experience incorporates your company’s brand, culture and values. Our team is tenacious in helping our clients and their people reach their goals and perform at the highest level. Our mission is to create learning solutions that empower an organization’s learners, reflect their brand and create a culture of continuous learning in their organization. We become an extension of their team to help solve business challenges and create engaging, result-driven learning solutions that resonate with their learners. In a faster, more complex world than ever before, LEO Learning sits alongside organizations to help them move learning to the heart of business strategy. With an unrivalled combination of experience, expertise and capability, our strategic mix results in learning architectures that fit seamlessly into global businesses and transform performance. G-Cube has a wealth of experience in developing learning solutions for different industries. This experience has given us an insight into the needs and learning patterns of different kinds of audiences. We create solutions that are thought-out and best-suited even when the timelines are challenging and content matter is diverse. TTEC is a leading global technology and services provider focused exclusively on the design, implementation and delivery of transformative customer experience. Our outcome-based customer engagement solutions provide human-centric, tech-enabled, insight-driven training and development programs for clients across the globe. TrainingFolks is an award-winning, global corporate training and development company providing learning solutions that help clients address key business challenges and build a higher performing workforce. Since 1997 we’ve been developing quality adult learning experiences using a proven engagement methodology, delivered by our learning experts. CoreAxis provides a unique combination of high-impact business performance consulting, coupled with custom training development and delivery. Our strength lies in our commitment to our clients. We take a singular approach to each engagement to develop strategies that drive lasting organizational change. Upside Learning Solutions Pvt. Ltd.
For Upside Learning, relationships come first. We know that a client who is miles away from us can only have faith in the relationship if we are trustworthy – that is, if we can deliver on time and in good quality every time. We’ve won more than 42 awards doing exactly that. Isn’t that a work culture and performance worth watching? We believe yes. AXIOM Learning Solutions, LLC is a learning and development services firm specializing in providing the right talent to fill your training needs. We offer staff augmentation and managed solutions. Our learning professionals become an extension of your workforce. We focus on customized learning solutions that meet your needs and business goals. Manipal Global Education Services is a part of Manipal Education and Medical Group. It is India’s largest education services group, running physical and online universities in India, Nepal, Malaysia, Dubai and Antigua. It currently offers services and support to over 400,000 students across its campuses, corporate and online platforms. With 19 years of experience, PulseLearning creates innovative learning solutions that bring measurable business value to clients. Best known for its work with major enterprise clients across North America, Europe and Australia, PulseLearning is award-winning for custom content development, staff augmentation, gamification and blended solutions. Caveo Learning provides the best outsourcing model that drives business results, flexibility and best-in-class services.